Mobility The dockless electric scooter: Sidewalk scourge or savant? The dockless electric scooter: Sidewalk scourge or savant? Electric scooters lie on a sidewalk in Los Angeles, Calif., on Feb. 13, 2019. Walking through parts of L.A., you see the scooters everywhere. Sitting on the sidewalk or knocked over, blocking the sidewalk. Dockless electric scooters – run by companies including Bird, Lime and Spin – started popping up in 2017 on the streets of several U.S. cities. You use an app to find the closest one, pay by the minute to take it as far as you need – at about 24 km/h – and then just leave it there. The companies typically hire people to round up the scooters at the end of the day, recharge them and put them back onto sidewalks. The idea is that you can take them on trips that might be too far to walk – for instance, getting to and from public transit – so you don’t have to take a car. 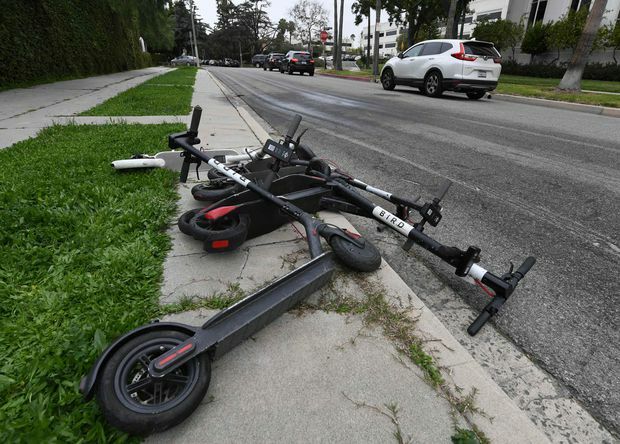 But in L.A., there have been gripes about safety – one small study of two L.A. emergency rooms found about 250 injuries among scooter users in about a year – about scooters blocking sidewalks for people using wheelchairs or disability scooters, and reports of frustrated locals burning and burying the gizmos. They’re part of a concept called micro-mobility – the U.S. had its first micro-mobility conference last month – and it includes not just scooters but various electric devices, including shared bicycles. It’s already in Canada, at least in pilot form. Lime has a dockless e-bike pilot running in Calgary and a scooter pilot in Waterloo. And the company says a number of city councils – including Victoria, Kelowna, Calgary, Edmonton, Winnipeg, and Windsor – are looking into how scooter pilots could work. Lime is running a scooter pilot project in Waterloo, Ont. E-scooters aren’t allowed on sidewalks or roads under provincial laws, so pilots would require provinces to make exceptions. In Ontario, e-scooters are allowed on private property, so Waterloo’s pilot is running on five kilometres of trails in the David Johnston Research and Technology Park at the University of Waterloo. October and November, the first two months of the pilot, saw more than 6,300 unique riders take more than 18,000 trips. Users pay a dollar to unlock a scooter and then about 30 cents a minute after that. To avoid scooters being left in the middle of paths, the city has set up parking spots along the route with 147 physical signs and encourages riders to use them. Lime staff also move scooters that have been knocked over or were left blocking paths. The scooters slow down to a walking pace, but don’t stop, when taken out of the pilot project area. Another difference between Canada and California? The Waterloo pilot was shut down for the winter as there were safety concerns about snow and ice – plus the scooters’ batteries have a lower range in subzero temperatures – and will run again form April to September. Waterloo will look at the pilot results to help determine whether the scooters could work in other parts of the city, including areas around the stations of its new LRT system, and what infrastructure changes might be needed. If rules change to allow e-scooters, then there’s the question of whether they’ll be allowed on sidewalks, on roads or only in protected bike lanes. Wherever they’re allowed, safety is still a concern. Even cities that say they aren’t considering pilots yet, like Toronto and Vancouver, say they’re still paying close attention to what’s happening in other cities and waiting for data.